To improve a classic is nearly impossible, but Mr. Mikame has done the unimaginable. 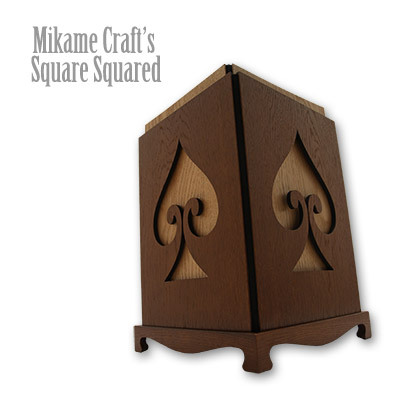 With a premier collaboration between Mikame Craft Inc and Murphy's Magic Supplies Inc, Square Squared is the classic Square Circle, improved for today's working magicians. A Deceptive device with better viewability for the audience and a removable gimmick for a surprise finale that is built into the load chamber. The immense quality of Mikame's hand crafted products are always produced with high quality materials and without question the most visually pleasing magic production product in the industry. Perfect for any stage performance. Doubles as a Collector's Item. Comes with a hand numbered digitally signed Certificate of Authenticity. Re-live a classic with a new astounding finale! The square squared introduces many new improvements to this classic of magic. These new improvements have turned this classic into a real fooler. A removable bottom plate inside of the load chamber makes the finale very deceiving. A new double window method makes tubes appear more "empty" as well as creating easier viewing for larger audiences. Hand crafted from high quality materials. Each piece folds flat for ease of storage and transportation.